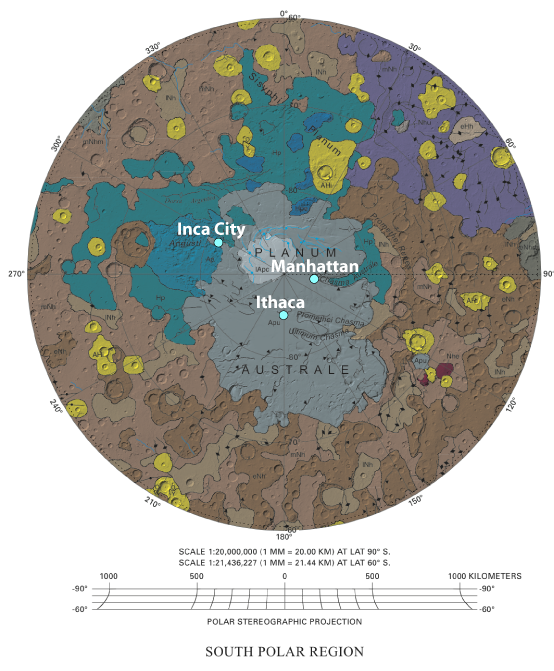 Inca City, Ithaca, Manhattan: Which part of the Martian Arctic do you want to see first? Mars Reconnaissance Orbiter and the HiRISE camera will soon begin the 5th Season of the South Pole seasonal processes monitoring campaign, and now’s your chance to decide which region will have its first observation from the new season prepared for public release by the HiRISE team. Often these first images are striking, and though the Sun is low in the sky and close to the horizon, there may be active carbon dioxide jets present and already starting to create the first springtime fans and blotches! Since January, we’ve been focusing on targets of interest from the Season 1 campaign asking you to help map fans and blotches in the areas nicknamed ‘Inca City‘, ‘Ithaca‘ (currently live on the site), and ‘Manhattan‘. To celebrate the start of the new monitoring season, Planet Four is partnering with the HiRISE team to organize a public vote where you get the chance to decide which of these three regions you want to see first. Voting will be open from August 1, 2014 9am GMT – September 1, 2014 9am GMT. We will be announcing the results on September 2nd. When the winning region’s first Season 5 observation is ready, we’ll post the image here on the blog. Whether it be the boulders of Inca City, the fans of Ithaca, or the lace terrain of Manhattan that strikes your fancy, cast your vote today (as often as you like) at http://www.planetfour.org/vote.